This is our now 11 month old Cocker Spaniel, Sophie. Our family lost our 11 year old Golden Retriever and our 12 year old cat last year within a three month time span. It was so depressing in our home without our furry family members. Deciding that we desperately needed some joy in our lives, I found Sophie from a breeder and my children and I fell in love with he from first sight. My husband reluctantly agreed to let us get her. He was not ready to bring in a new pet. When we brought Sophie home, she immediately latched onto my husband. Within a day, he was smitten and she is now his best buddy. 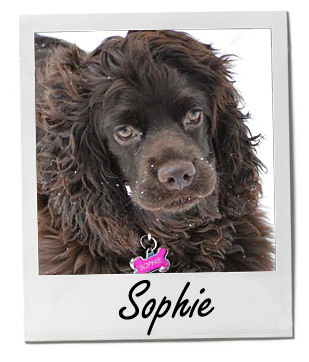 We miss our other pets, but Sophie has helped bring happiness back to our home.